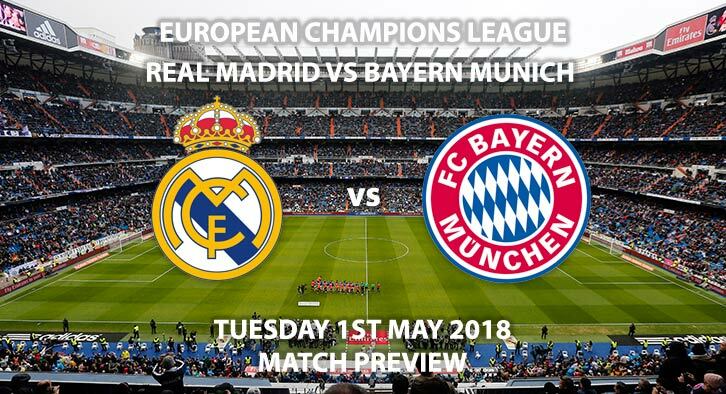 Real Madrid vs Bayern: Real Madrid face Bayern Munich in the second leg of their Champions League semi-final looking to secure a third consecutive final appearance. Goals from Marcelo and Marco Asensio gave Madrid a 2-1 victory at the Allianz Arena. Despite taking the lead through Joshua Kimmich, Bayern conceded two crucial away goal which sees them chasing the game ahead of their meeting at the Bernabeu. Zinedine Zidane’s side held a lead from the first-leg in the last round before almost losing to Juventus. This time around they will be much more focused on securing a third Champions League final in as many years. Gareth Bale continues to struggle to break into the side, after being left as an unused substitute in Germany. With Zidane preferring Isco, Asensio and Lucas Vasquez from the start, the Welshman’s future looks far from secure. Speculation has risen about a potential deal which could see long-term target Robert Lewandowski head to the Bernabeu, with Bale moving to Bayern. Bayern come into this game as the underdogs. They must to score at least twice against the current holders to stand a chance of making it through to the final. With that in mind, expect Bayern to name a bold team selection as they bid to break down Real. This game is far from over, though; this year’s competition has been full of memorable comebacks. Jupp Heynckes’ side bounced back from defeat with a 4-1 victory at the weekend and will be confident of getting a result on Tuesday night. Cuneyt Cakir is the referee for this crunch clash. The Turkishman, who has been an international referee since 2006, was in charge of a number of this season’s group stage matches, including Bayern’s 3-1 home victory over Paris Saint-Germain F.C and Real Madrid’s 3-1 defeat to Tottenham Hotspur. He has an average booki g points total of 55.4 this season, which is very high. As a result, I’d advise a maximum points total of 30+ each team. Real Madrid are in the ascendancy in this tie. They hold the lead and know Bayern have to come and attack them. Zidane should be able to navigate them to yet another final and I’m backing them to win. Real Madrid vs Bayern Munich will be televised live in the UK on BT Sport with kick-off at 19:45 GMT. Prediction: Real Madrid 3-1 Bayern Munich. Correct score, Madrid 3-1 – (link no longer available). Ronaldo to score a brace – 7/2. Ronaldo and Lewandowski to both score – 11/4. Isco to score and Real to win in 90 mins – 6/1. Over 2.5 goals, over 10.5 corners and over 35 booking points – 15/8.